This page shows the 'Oldroyd's' pots originating from Halifax, Yorkshire. 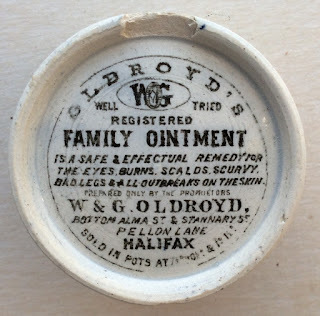 Wiiliam and George Oldroyd, established a large family concern during the second half of the Victorian era, which concern became a very succesful Chemist and Druggist business located in Halifax. Unusually, the pots produced by Oldroyd's carry a transfer on the base of the pot. So diggers, be sure you check carefully all pots that you uncover as what may appear to be a plain pot may well have a transfer on the underside! The pots list three prices but only two sizes of the pot are known so far. Prices listed are 7½d, 10½d and 1s 1½d. 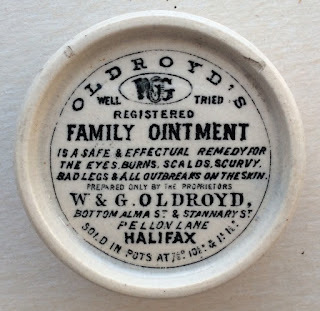 Further detailed information regarding the Oldroyd Family Ointment can be obtained from the Historical Guide to Delftware and Victorian Ointment Pots book produced by Messrs. Houghton & Priestley, page 109.